As I often say, I'm always watching cooking shows on TV. I love to watch and learn and try and experiment. I'm most particularly drawn to different types of cuisine with which I have the least amount of experience. Lately I've been watching The Cooking Channel like it's my job. I absolutely LOVE that they have so many new shows devoted to food from so many different countries and cultures. One of my new faves is Chinese Food Made Easy. I seriously want to try every single recipe! Well, even though I don't have a wok, I decided to try this one. It was SO quick and simple to make and it's absolutely delicious! 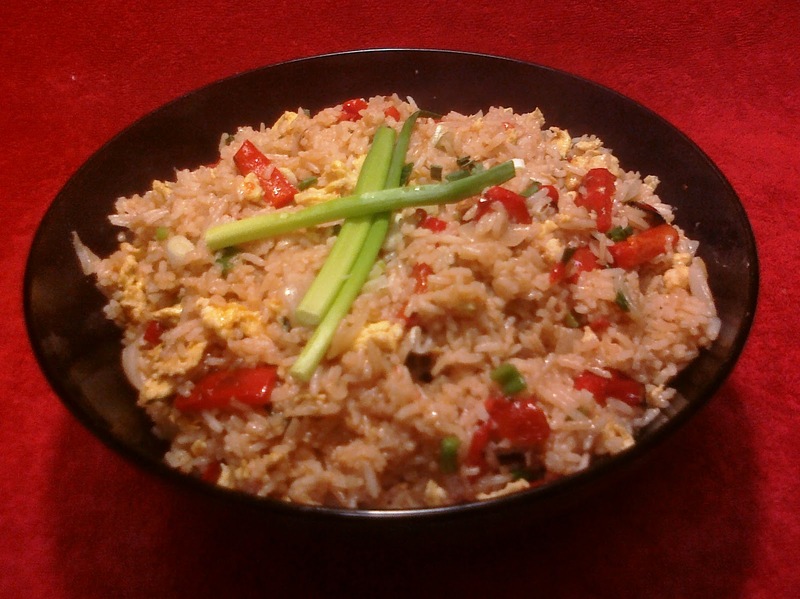 The first time I made it, I brought some to my Dad, who is a huge fan of fried rice. He loved it! Then, with a few suggestions from my Jeanie, I added a few other ingredients to the recipe, and it's now one of my new favorite dishes. It's not exactly as I saw on the show, but it's how I make it, and I love it. If you like Chinese food, then you MUST try it. In a small pot with a lid, saute chopped onion in a small amount of oil until softened. Add uncooked rice and continue to saute for just a minute or so. Add chicken broth, give it a good stir, place the lid on top, and reduce the heat to low. Let it cook until the rice is tender and all the broth is absorbed, about 15 minutes. In the meantime , prep all of your other ingredients. In a large nonstick skillet or wok, place the bell peppers and a little oil. Saute quickly over high heat until slightly softened, but still crisp tender. Push the peppers off to one side of the pan. Add beaten eggs. Keeping them separate from the peppers, stir to scramble. Once the eggs are done, you're ready to put it all together. Add the cooked rice and continue to stir. Add the garlic and ginger along with the tomato and the scallions. Finish the dish with soy sauce and sesame oil. Stir fry everything well combined. Serve immediately. Once the rice has finished cooking, it really goes very quickly, so you should definitely have all of your other ingredients prepped before you start to assemble the dish. The secret ingredient is the toasted sesame oil. Well, the soy sauce too, but more so the sesame oil. If I didn't have it, I'd probably choose to make something else. It's THAT important to dish. It's what gives it the authentic Chinese cuisine flavor. If you'd like to add a little heat to the dish, add some chopped chilis to the pan as you saute the red bell peppers, or just sprinkle the dish with some crushed red pepper flakes. This recipe can be easily adapted for vegetarians simply by using vegetable broth instead of chicken. If you're a vegetarian who chooses not to eat eggs, then by all means, omit them. It'll still be a wonderful dish! You can find jasmine rice in any supermarket right next to any other kinds of rice, but feel free to use any long grain rice if it's what you have on hand. For an extra added touch, sprinkle the final dish with toasted sesame seeds. 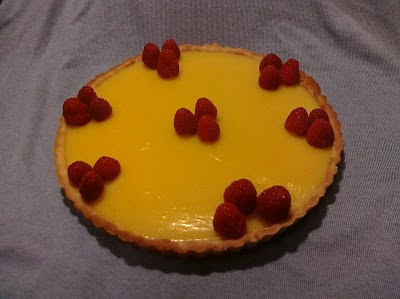 As I continued to search for "anything lemon" as is often requested, I decided to do a lemon tart. This would normally consist of making dough for the crust, letting it chill in the fridge for a while, rolling it out, placing it in a tart pan, blind baking it, and then filling it with a delicious home made lemon curd. Not that any of that is particularly difficult, but I kind of wanted something that was a little easier. I wanted a crust that I didn't have to roll out, and didn't have to blind bake. That would certainly make things easier, right? Yes, I knew I would still have to blind bake the crust, because a lemon tart always has a baked crust, but I just didn't feel like dealing with pie weights or beans, etc. I also wanted a simple lemon curd recipe that doesn't require a double boiler and is easy to make while the crust is baking. 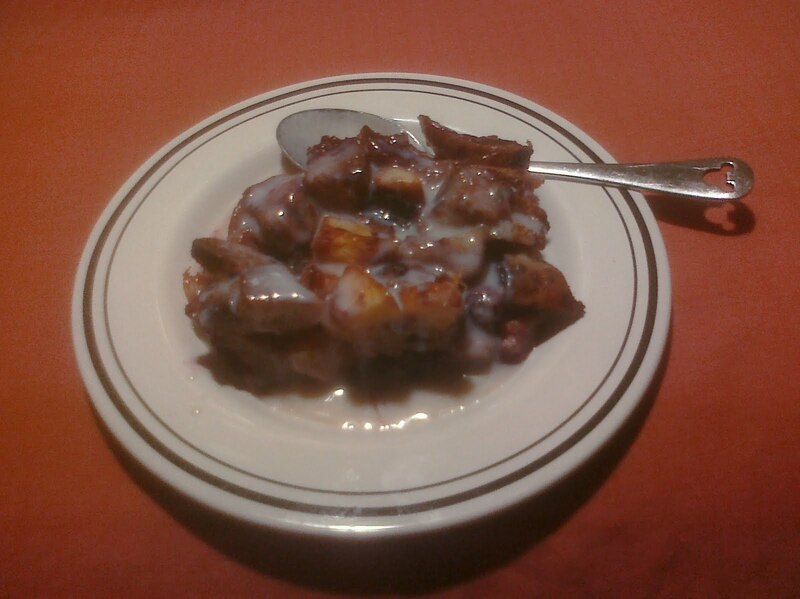 So I did some searching and decided to combine a few recipes to come up with exactly what I wanted. And here we are! This recipe is everything I just mentioned, and of course it's delicious! The crust is kind of like a shortbread cookie, instead of the usual pie crust pastry, so all you need to do is press it into the pan with your fingers. No rolling! And the lemon curd? Well, it's Miss Ina's recipe, so you know it's delish. Give it a try! Grease with butter, or spray with a nonstick vegetable cooking spray, an 8 - 9 inch tart pan with a removable bottom. When the pastry is completely chilled, place the tart pan on a larger baking pan and bake until the crust is golden brown, about 13 - 15 minutes. Remove from oven and place on a wire rack to cool while you make the filling. Remove the zest of the lemons with a vegetable peeler or zester, being careful to avoid the white pith. Squeeze the lemons to make 1/2 cup of juice and set the juice aside. Put the zest in a food processor fitted with a steel blade. Add the sugar and process for 2 to 3 minutes, until the zest is very finely minced. In the bowl of an electric mixer fitted with a paddle attachment, cream the butter with the sugar and lemon zest. Add the eggs, 1 at a time, and then add the lemon juice and salt. Mix until combined. Pour the mixture into a 2-quart saucepan and cook over low heat, stirring constantly, until thickened, about 10 minutes. The lemon curd will thicken at about 175 degrees F, or just below a simmer. Remove from the heat. Fill the tart shell with warm lemon curd and allow to set at room temperature. I used an 11" tart pan instead of a 9". You can use either one, but you'll have a much thinner crust with the 11". The curd recipe calls for 4 extra large eggs, but I only had large eggs. So, I just used 5 large eggs instead of 4 extra large. It's not exactly the correct amount, but it worked fine. After letting it come to room temperature, I placed it in the fridge to chill completely which helped it to set up. You may have extra lemon curd if you're using a 9" pan because this recipe filled my 11" pan perfectly. If you do find yourself with extra, just keep it in the fridge and use it as a fruit spread on toast, scones, English muffin, etc, just as you'd use jam or jelly. Although this tart stands beautifully on its own, I topped mine with some fresh berries, as you can see. What's not to love? One of the great things about doing a recipe blog (besides sharing my favorite recipes with all of you) is that it's a great way to archive my recipes. I must say that I often find myself looking up recipes on my own blog from time to time, just because it's easy and it's handy. But every once in a while, I'll search for a recipe that I haven't posted yet. I'll think "Wow, I really thought I posted that one already", but no, it's nowhere to be found. 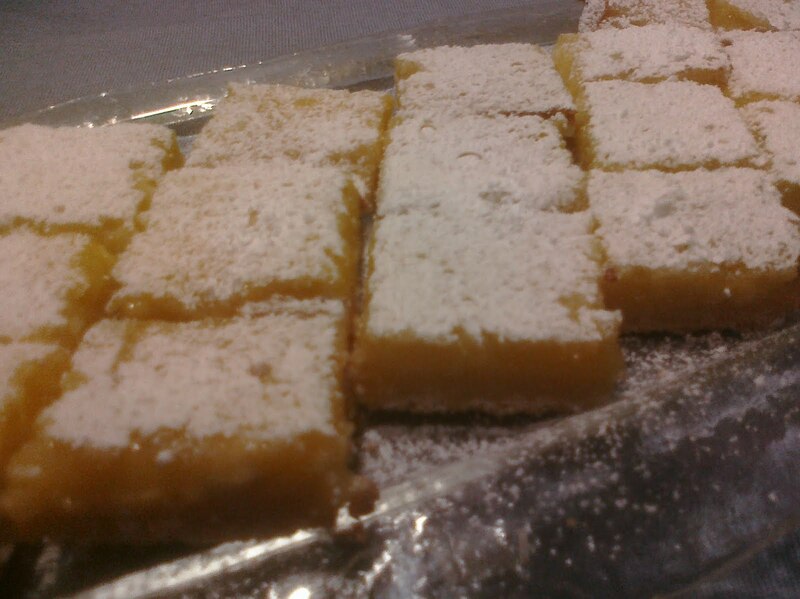 Such was the case with these awesome lemon bars. I had a request to make them for a party, so naturally I turned to my recipe archive. I looked them up. Nothing. I thought "How have I gone this long without posting this recipe?? It's one of the all time favorites!" Ah well. The important thing is that it's here now. I first made them years and years ago. The original recipe was from my favorite Mrs. Fields Cookie Book, but then I tweaked it a little. I wanted them to be more lemony, like SUPER lemony, and this was the result. Once you taste them, you'll agree that they're aptly named. You just can't help but pucker up! Now that they're finally in the archive, I hope you like 'em! To make crust, sift together flour and sugar. Using two knives, cut butter into sifted mixture until it resembles coarse crumbs. If you have a food processor, it's easiest just to throw everything in with a metal blade, and pulse it until it's well combined. Press firmly into an 8x8 baking pan, and bake for 20 minutes. While that is baking, make the filling. Whisk together all filling ingredients excepts the chips and the powdered sugar. When the crust is done, sprinkle the chips evenly over it. (no need to cool the crust). Carefully pour the filling mixture over the chips. Bake for another 20 minutes or until set and slightly golden around the edges. Cool completely or chill before dusting with powdered sugar and then cutting into squares. This recipe can be doubled and then baked in a 9x13 pan. They will be slightly thicker. Also try them with limes instead of lemons, and even add a little sprinkling of shredded sweetened coconut. Yum!